LinkedIn’s new “Intro” iOS app directs all e-mail sent or received on an iOS device through LinkedIn’s servers. Yes, you’ve got that right. Has LinkedIn been acquired by the NSA? Sorry, bad joke, poor taste – but I couldn’t resist. It crossed my mind. So what’s this to do with BYOD? Many organizations are still sitting on the sidelines with regards to BYOD. They are passively permitting their employees to use iOS devices (and Androids, Windows phones too) to send and receive corporate e-mail, mostly on unmanaged, personally owned devices. This means that organizations that presently permit their employees to send and receive e-mail using personally owned iOS devices are at risk of all of that e-mail to be read (and retained) by LinkedIn, by every employee that downloads and installs the LinkedIn “Intro” app. Organizations without MDM (mobile device management) are powerless in preventing this, for the most part. This move by LinkedIn may finally get a lot of organizations off the fence in terms of BYOD, but employees might not be happy. Organizations’ legal departments are going to be having aneurisms right and left when they learn about this, and they may insist that corporate IT establish immediate control over personally owned mobile devices to block the LinkedIn Intro app. Corporate legal departments usually get their way on important legal matters. This is one of those situations. When Legal realizes that LinkedIn Intro could destroy attorney-client privilege, Legal may march straight to the CIO and demand immediate cessation. That is, once you peel the Legal team off the ceiling. Nothing like a crisis and reckless abandon by a formerly trusted service provider to get people moving. This article does a good job of explaining the evils of LinkedIn Intro. My respect for LinkedIn could not be at a lower point if they publicly admitted that they were sending your content to the government. This entry was posted in Privacy, Risks, threats and tagged email, email forwarding, email hijacking, email privacy, LinkedIn, LinkedIn Intro, NSA on October 27, 2013 by peterhgregory. The truth is, I’ve been irritated about tracking cookies for over ten years. Ever since I was an advisor on a corporate privacy project, I learned just how extensively our Internet browsing habits and patterns are being recorded. I don’t appreciate that kind of “over your shoulder” scrutiny and personally consider it an invasion of my privacy. The ad agencies defend their position of tracking cookies as their way of enriching my browsing experience. Whatever. I turn a blind eye to most ads anyway, but the idea of tracking where I go puts us on a slippery slope of Internet usage tracking that is not unlike what I believe occurs in communist China today. Don’t misunderstand me. I don’t surf to sites I don’t want anyone to know about. While I am at work I am implicitly accountable to my employer for all of my usage of corporate owned assets – Internet access and personal computer included. And when I’m at home or on the road with my MacBook, I use OpenDNS that records where I go and blocks access to unwanted sites. My accountability partner is free to see those records on request. Anyway, back to my main point – those tracking cookies. There is a way to opt out from nearly all of them. Before you spring into action, however, you will want to read this article all the way through, as there are several notes at the end. Whichever option above you choose, know this: you will need to perform this on each browser (that is, Internet Explorer, Firefox, Safari, and so on) on your computer. Your computer’s cookies are managed separately by each browser, so you’ll have to go through the above procedures for each one you use. I use primarily Firefox on my Mac systems, and I’ve opted out of all of the sites I could find. I’ll have to do this later with Safari (which I use only occasionally). You will need to do this on each computer you use. You may be thinking, why not just turn off all cookies (or at least all tracking cookies) on your browser. Certainly that would block all tracking cookies, present and future. Sure. But you would also certainly hamper the functionality of many of the websites you visit, particularly those you log in to in order to use the site’s services. But if you are into extreme measures and a little experimentation, I invite you to turn off cookies and see how things go. I will bet, however, that you will soon be turning them back on so that the important sites you use will keep working the way you want. This entry was posted in Privacy and tagged cookies, LinkedIn, opt out, Privacy, tracking cookies on January 16, 2010 by peterhgregory. Over one year ago, days apart, I began to receive e-mail messages addressed to others. For weeks I worked diligently to try and put a stop to it. My requests fell on deaf ears. I receive regular reminders that it is happening still. I began to receive many (or all) e-mail messages addressed to someone named Sandy, who lives in Ontario Province, Canada. The domain name is Eastlink.ca, a broadband access provider. It didn’t take long to figure out that I was receiving all of Sandy’s e-mail. I wrote to Sandy, suggesting she complain to her ISP. And of course I also received a copy of the message in my own inbox. I wrote to Sandy a couple of times and never heard from her. I guess she doesn’t care – or maybe she did not receive them. I also complained to Eastlink.ca, and heard nothing from them. I also receive all of Brian’s e-mail, and his ISP is ica.net, another broadband access provider in eastern Canada. I complianed to ica.net, several times, and never received a response. I wrote to Brian also, and he responded and suggested I change my e-mail address. As if! I also receive messages to someone at charter.net, but this user’s e-mail address does not indicate their name. I wrote to them and to Charter.net – you guessed it: no response. Soon after this began, I wrote inbox rules to immediately delete all e-mail messages addressed *to* these user accounts that ended up in my inbox. Now and then I look in my Trash Bin (where deleted e-mails go), and sure enough, there are still scores of e-mail messages: thank you’s for online merchant orders, FaceBook invites, e-cards, and personal correspondence. I don’t read these messages. Some of these messages still come to my inbox – this includes messages where the recipient is in the BCC (blind carbon copy) list. My inbox rules don’t know how to respond to these. I wish this would stop. I’m going to write to ica.net, Charter.net, and eastlink.ca again, but I’m not expecting any response, not to mention action. I cannot imagine that this is happening only to me. If some malevolent (or even accidental) action is behind this, then chances are that hundreds or thousands of other users’ e-mail messages are also being forwarded without their permission. This also makes me wonder if this is happening to MY incoming e-mail: could some other user out there be receiving messages sent to me? I sure don’t relish that idea: sometimes I receive “reset your password by clicking on this URL” messages. What if someone else receives these and decides to click the one-time link before I do? Some online account of mine could be compromised as a result. I’m also worried about my own liability in this matter. I’m receiving e-mail messages that are supposed to be sent to others. I don’t want them, I don’t read them, and I delete them when I see them. But what if I receive messages containing personal medical information, for instance? Malware, tampering, or compromise of ISP e-mail server. Compromise of individual users’ e-mail accounts, where attacker inserts rules to forward mail to me (and maybe others). Malare or compromise on individual users’ computers; this may be true if users use workstation-based e-mail software such as Outlook, Outlook Express, or Thunderbird. There may be other potential causes, but I cannot think of any more. If malware or a human intruder were behind this, what is their gain? What is the benefit for an intruder if someone’s e-mail is forwarded to someone who lives 3,000 miles away? If the intent is to harm someone, who does it harm? If the intent is to harm the individuals whose e-mail messages are being forwarded to me, then I can think of several more malicious ways to harm them. If the intent is to harm me, I don’t see how this harms me. This entry was posted in Opinion, Privacy, Risks and tagged e-mail, e-mail forwarding, LinkedIn, malware, Privacy on December 15, 2009 by peterhgregory. A reader asks: I have a friend who heard that we can be “watched” while we watch online videos. Any truth to it that you know of? Answer: Theoretically yes, but only if you have a webcam (if you literally mean “watching”). I’ve heard of it being done. If you mean “knowing what you are watching” (some kind of tracking), that is certain. Youtube remembers what you have seen (it can be embarrassing), and other vid sites do too. Sites do this with tracking cookies and other means to remember what videos you view, what pages you see, and the sites you visit. This entry was posted in Privacy, Q&A and tagged webcam, YouTube on November 4, 2009 by peterhgregory. India has decided to issue biometric ID cards to each of its 1.2 billion citizens. Delhi recently established the Unique Identification Authority that will assign unique ID numbers to each citizen. This will create a demand for knowledge about how biometrics works. 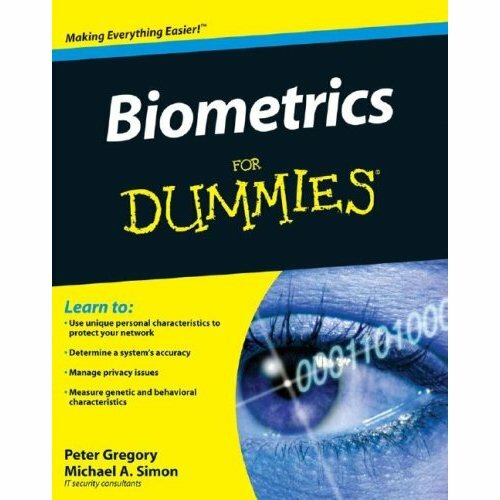 Biometrics For Dummies, published in 2007, meets that need. “This is a huge deal in the world of biometrics,” writes Mike Simon, co-author of Biometrics For Dummies. This entry was posted in Privacy and tagged biometric ID, biometrics, India, India ID, LinkedIn on July 21, 2009 by peterhgregory.